As a former small hobby farmer in Oregon and translator of agricultural texts, I can't resist a good dictionary - or even a bad one - related to agriculture and food production. These fields often have very specialized terminology, and the terms in English often vary by dialect (UK, US), so it isn't always easy to find the right expressions eve if you do have a reasonable grasp of the field. Despite the key role that agriculture plays in the international economy, this is also not an area overloaded with multilingual dictionaries like, for example, IT or engineering technology. In many ways, the publisher Elsevier seems to play the role that VEB Verlag Technik Berlin did in the old GDR. The publisher distributes many specialized dictionaries which often appear to be the only ones of significance in their field. So it is with agriculture too. 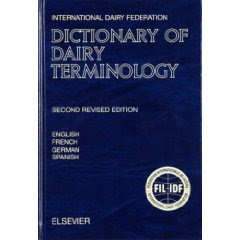 When haunting the used book options of eBay with my preconfigured searches, I have managed to net two useful volumes for a total of about 20 euros, which otherwise would have cost me the price of a plane ticket to visit family in the US: the International Dairy Federation Dictionary of Dairy Terminology and the Dictionary of Agriculture. I bought the former on a whim, simply because I like to collect dictionaries, but it has found practical use in a number of projects translating about cheese making, yogurt and milk hygiene. The second volume stays close to my knee when I'm doing combines and forage harvesters or other related topics. To be honest, I would have gotten full value out of these at the retail price, but I'm glad to have saved what I did. There are so many things to be found there that can often be found nowhere else. Internet glossaries cannot cover everything, especially if you don't know enough to filter the noise.